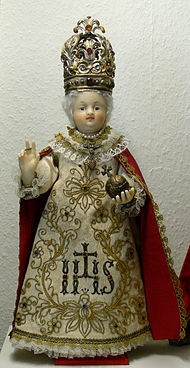 The Infant/Child of Prague is a small wax medieval statue of the Christ child, adorned in an elaborate robes, housed in the Carmelite Church of Our Lady Voctorious in Malá Strana, Prague. Copies/reproductions of this statue were at one time found in the majority of Catholic homes around Ireland. This little statue was called upon for help to ensure good weather for family occasions such as wedding, communions and confirmations. Prague is a long way from Ireland so how did the tradition of this statue from the Czech Republic arrive in Ireland? The very early history of the statue is obscure but it appears to have been made in Spain and the Spanish noble woman Isabella Manrique gifted the statue to her daughter Marie on the occasion of her wedding to the Czech nobleman Vratislav of Pernstyn. Later the statue came into the possession of her daughter the Princess Polyxena von Lobkowicz, who in 1628 presented the statue to the Carmelite friars at the church of the Virgin Mary the Vicorious in Malá Strana, Prague. Have pity on me, and I will have pity on you. Give me my hands, and I will give you peace. The more you honor me, the more I will bless you. The statue was later restored to its former state and the damages such as the loss of its hands, that had occurred over the years, were repaired. In the ensuing years any miracles were performed and devotion to the statue grew steadily and spread. Over the years tiny and very elaborate vestments were given as gifts to the statue. In 1713 the caretakers of the statue began to change the robes of the statue according to the liturgical norms. The statue has a wardrobe of around 100 hundred vestments. In 1913 Pope Pius X established a confraternity to the Infant of Prague and today over 2 million people visit the shrine annually. Devotion to and small replica statues of the Infant of Prague became popular in Ireland in the late 19th to early 20th century in Ireland. Over the years the statue has become linked to Irish wedding customs. Although there are some variations, most customs insist on placing of the statue outside of the brides house under a hedge or bush in the garden to guarantee fine weather. Some people say the statue needs to be outside the church where the wedding is to take place and others even go so far as to bury it in the garden. The custom developed from a belief that the statue can control weather. The statue was even used to try to aid good weather for this years G8 summit by Ferghal Purcell the general manager of the Lough Erne Resort, the location where the summit was being held. Navan born actor and former bond star Pierce Brosnan engaged in the custom for his wedding to Keely Shaye Smith. We got married in Ballintubber Abbey and held the reception in Ashford Castle, it was August and I remember this old woman telling me we had to get a Child of Prague statue and put it outside the west corner of the building to make sure it didn’t rain. The Child of Prague is a little statue of Jesus dressed as a king and it’s an old tradition to put it out the night before a wedding. So I staggered out after my night out with the lads and many Guinnesses into the gardens of Ashford Castle and found a hydrangea bush and put the statue in it (Taylor 2013). There is also a tradition that the power of the statue was strongest if its head has been knocked off but his had to happen “accidentally”. Headless Infant of Prague photo provided by Maura Wall Barret. This entry was posted in Uncategorized and tagged Irish Wedding Traditions, religious statues, The Child of Prague, The Infant of Prague. Loved this post – what an enviable wardrobe! I remember these at home and because of the shape – wide body, small head they were regularly decapitated as the alabaster was in no way resilient. I also recall looking at it and thinking what a strange looking thing it was – a baby done up to the nines in exotic robes! 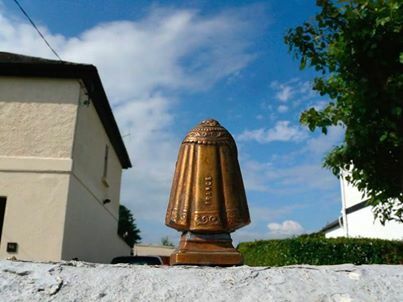 I have noted in recent weeks that these are still around the place in big numbers – in a jewellers in Limerick I was in last week and also in an opticians, so they still have some sort of protective powers.Still often hear of ‘putting the child of prague out’ when good weather is needed for an important event – wonder if it works! Great post – thanks! Your very welcome. I have been fascinated by them for ages, we never had one in our house but my grandparents did. I have heard stories of the statues being left in precarious position in the home and in the path of children in the hope of the head braking. I so enjoy collecting Infants from Thrift Shops, they have ended up there at the end of a life, a home and due to dust, age and a possible accident need a wash, vestments cleaned, refurbished and a little paint here and there. Oh how they respond ! In particular the ones made in Italy.I never ever have to or want touch the face or the eyes..so beautifully painted originally, they follow me around the room. My favorite is two feet tall with gold metal, jewel encrusted crown, dressed in batthenberg lace gown and purple vestments. My mother put the statue of the infant of Prague under a shrub in the front garden the night before my wedding. It stopped raining for approx. 10 min. On the day. I love them. We used to make some lovely replicas back in 70′ with my father at his worksshop in Galway. thanks so much for sharing your story Lizzie. So many interesting traditions associated with the statues. I moved house 6 months ago .have 2 dogs .i status child of Prague . Only 1 of my dogs walks by it daily and each time brushes against it till it rocks but never falls over . It’s very strange .never did It in last house . It’s always around statues head . Wonder if anyone else has had this happen or throw some light on this story .its amazing to watch it . My mother carried a small metal plaque in a little plastic wallet in her purse. She did this so she would never be without money. I kept it for years. She will have her fiftieth anniversary next year. Couldn’t swear to the fact that is still somewhere in the house. She was always on the superstitious side.